If you are a sports car enthusiast, the Dodge Viper SRT has probably been on your radar at some point. The Viper was crafted by Dodge’s special group of engineers, the Street and Racing Team (SRT), a team dedicated to performance. The Dodge Viper ACR has more track records than any production car in the world. 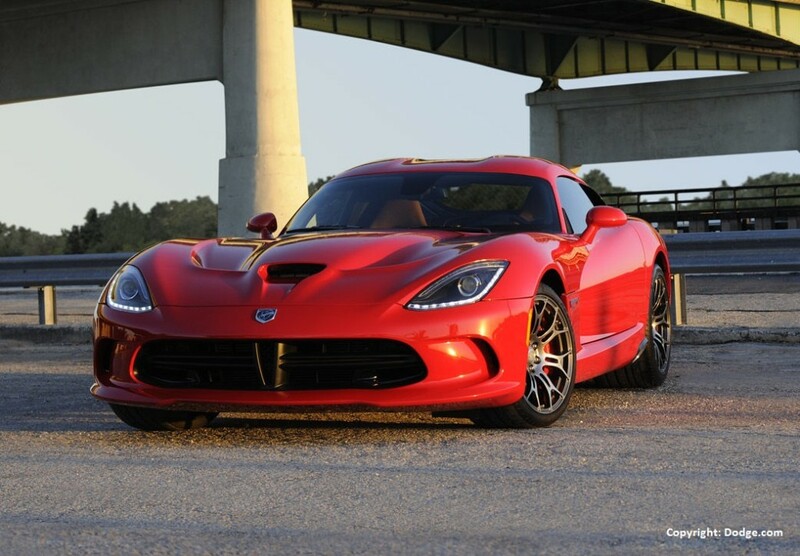 In 2016 Dodge released six special-edition models that are also the final Dodge Viper models. If you’ve fell behind on your Viper news and specs, read below for a refresher. The Dodge Viper, originally conceived in late 1988 at Chrysler’s Advanced Design Studios, didn’t truly begin development until a concept of it was presented at the North American International Auto Show in 1989. Reactions were so enthusiastic about the design, a team of 85 engineers, code named “Team Viper”, began development son after. That fall, the body was completed, and in 1990, the V10 engine was produced for use. Two years later, Dodge and the SRT released the Dodge Viper, January 1992. Since then, it has gone through three generations and varying phases of design, starting with the first generation, the Dodge Viper RT10, which lasted from 1992 – 2002. The second generation, Dodge Viper SRT-10 lasted from 2002 – 2010; both models went through two phases of production, and the SRT-10 was discontinued in 2009. The famous sports car wasn’t gone forever though, as it came back in 2013. After 25 years of production, the Dodge discontinued the Viper in July 2016. To send it off in style, Dodge released five exclusive limited-edition 2017 Viper models – the 1:28 Edition ACR, GTS-R Commemorative Edition ACR, VoooDoo II Edition ACR, Snakeskin Edition GTC (25 units), and the Dodge Dealer Edition ACR. All 217 2017 Viper units sold out in days. In response to the high demand, a sixth special edition model was added in mid-july, a total of 31 units, which also sold out shortly. Why all the craze to get one of the last Dodge Viper models? Speed, power and design. As mentioned above, the engine that powers all 2017 Dodge Viper models is a handcrafted 8.4-liter V10 SFI engine. “SFI” stands for “sequential fuel injection”, a process where fuel is injected into all ten cylinders at once, meant to improve efficiency and emissions. Its engine puts out 645-horsepower and 600 lb-ft of torque, the most of any naturally aspirated sports car engine. In 2016, the 2016 Dodge Viper ACR recorded never-seen-before lap times at 13 tracks across the country, including world-famous Laguna Seca, Road Atlanta, and Virginia International Raceway. Why all of the tracks? The latest rendition of the Dodge Viper SRT, the 2010 Dodge Viper SRT-10, was able to accelerate from 0-60 MPG in 3.6 seconds and it covered a quarter mile in 11.8 seconds. Car and Driver tested the Viper out and its track times were faster than a variety of performance cars including the Corvette Z06, Ford GT, Nissan GTR, Porsche 911 Turbo, and 911 GT3. Though the engine is impressive and very important to the Viper’s performance, its exterior features are equally as important. Mechanical components that help enhance the Viper’s performance are a performance-grade suspension, a robust Brembo brake system with black Brembo brake calipers, and a specially designed hood. The hood of the Viper is made from a single piece of hand-laid carbon fiber, and performance-designed air extractors helps to keep the engine cool while a central air intake maximizes airflow. All of this together helps the Viper achieve its 645 horsepower and track times. For a little bit of style, Adrenaline Red SRT Racing Stripes, Bright White SRT Racing Stripes, Gunmetal SRT Racing Stripes, and Venom Black SRT Racing Stripes are available. The hood itself is a signature hood used on SRT vehicles. A bright chrome front fascia medallion comes standard, as does dual side exhaust. Riding on 18-inch Rattler polished wheels, the Viper SRT is fitted with P295 performance tires. The vehicle is available in eight different colors. The maximum seating capacity for the Viper SRT is two passengers in cloth performance bucket seats. The interior components are given special attention to detail, with a graphite instrument panel bezel, sport pedals, an SRT steering wheel with black stitching, and SRT leather gear shift knob. The Viper SRT interior is available in black and two color combinations of black/orange and black/cyan. Like many FIAT Chrysler automobiles, the Dodge Viper comes with the UConnect system; the SRT with Uconnect 8.4 NAV and Access. The apps and sound are are controlled via an 8.4-inch touchscreen display and steering wheel-mounted controls. A 7-inch configurable digital cluster display can be found in front of the driver seat, and the sound system is made up of Harman Kardon 12 high performance audio speakers. Many performance parts by Mopar can be found in the Mopar Performance Parts catalog. Specialized exhaust systems, improved brake rotors, front strut brace suspension/steering, and ultralight 14-spoke production wheels are are available. Being the race car that it is, the Viper SRT is not without important safety features. Included are advanced multistage front airbags, 3-mode electronic stability control, rain brake support, a premium security alarm, and speed sensitive power locks. For convenience, the vehicle also comes with keyless enter-n-go passive entry, keyless entry with engine immobilizer, a ParkView rear back-up camera, and child seat tethers. The starting MSRP for the 2017 Dodge Viper SRT is $89,995. It has the standard Dodge warranties – basic 3-year or 36,000-mile warranty, powertrain 5-year or 60,000-mile warranty, rust-through Coverage for 5 years or 100,000 miles, and roadside assistance for 5 years or 100,000 miles.